So the other day I got an email from one of my subscribers and she was having some trouble completing her ENS name registration using my original ENS tutorial which you can find here. In that original tutorial I talked about the new universal FIO protocol, but also outlined step-by-step on how to register your own Ethereum based custom address. My tutorial left off with the successful creation of my auction, but there is MUCH more to it that I found. Follow along for Part 2 of my ENS tutorial where I show you in pictures exactly what you need to do once you start your auction and even what happens if you missed your reveal or auction end date. Looking for Part 1 of this tutorial? Click here. 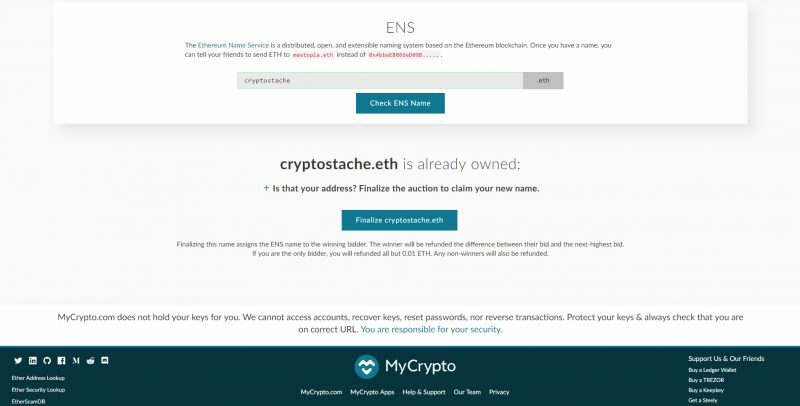 I realized that I totally missed my auction end date and had no idea of the status of my custom ENS name; Cryptostache.eth. Thanks to Lucia for pointing this out to me and asking for my help in solving her own issues with it. If you miss your auction or reveal date, no worries! Your bid amount of ETH that you sent is NOT lost and you can just re-use it to restart the auction. This was my case. I reached out to MyCrypto.com support and they directed me to the right article on how to restart your auction if you forgot to reveal your bid. No one else bid against me so I followed those instructions. You are basically sending a transaction for 0 to the same address you originally sent your ETH bid to and that will restart the auction. You will get a new "reveal" date as well. I failed to take screenshots of this process, but the instructions are clear and I did not have any trouble reinstating my auction. I DID have to pay additional GAS fees of like $0.06. 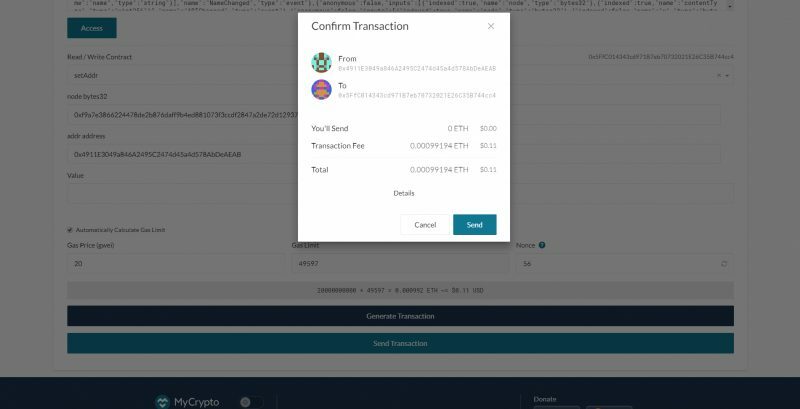 Once I sent this zero transaction and paid the GAS fee by confirming it on my MetaMask (that's the wallet I used, but you can use any of the options that MyCrypto offers like a Ledger or Trezor). This transaction confirmed and I got a new reveal date. I made sure to copy down the 3 secret words, remember how much ETH I originally bid (0.01) and copied that full grey box of text too just in case. I put the date on my calendar this time so I would NOT forget to reveal my bid like I did last time! 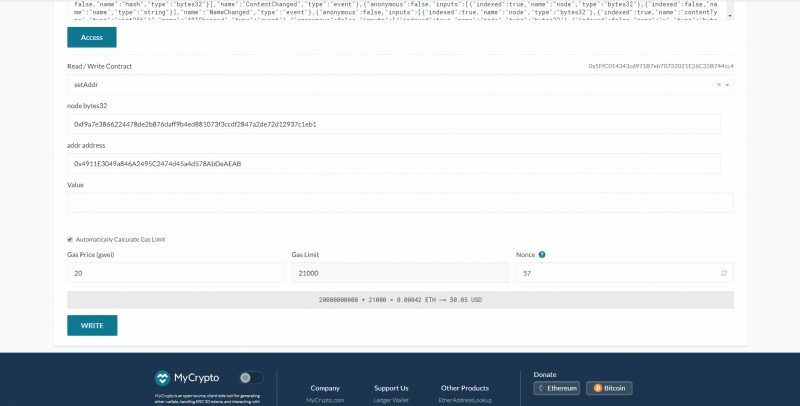 After 3 days I went back to MyCrypto.com/ENS, made sure my MetaMask was connected to MyCrypto, and put in my address (cryptostache.eth) again in the box. This time it said "Time to Reveal your bid". Once again, I apologize that I forgot to take screenshots of this section, but basically it asks you what your original bid was (mine was 0.01 ETH) and it will ask for those 3 secret words OR that long amount of data in the grey box. I used my original 3 secret words and confirmed the transaction. This costs nothing, but like any transaction happening on the Ethereum blockchain you have to pay GAS fees which were $0.06 for this. It confirmed that I had revealed my bid and no one else bid against me. Now you have to wait another 2 days!!! This whole process is NOT easy to accomplish and you can mess it up if you are not meticulous. They give you a new "Auction End Date" which is 2 days after you complete this process. Ok here is where I started to take screenshots again and I am glad I did because this was the more complicated part. After the 2 days had passed I went back to MyCrypto.com, logged in with my MetaMask, and went to the ENS page. I put in my ENS name again, cryptostache.eth, and it says "Someone already owns this name". It was me! Unfortunately this is not your last step. 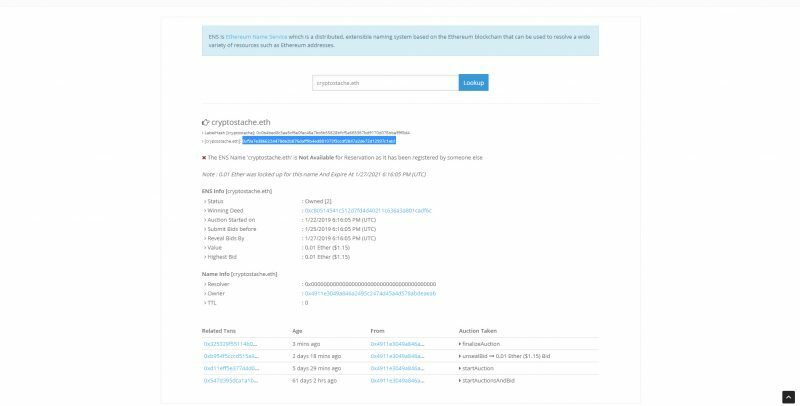 I realized that MyCrypto.com was not giving me the right button to finalize my name after entering my name in the search, so I had to go back to their legacy ENS page which is at https://legacy.mycrypto.com/#ens. I put in my name again and this time I got the above screen with the button "Finalize cryptostache.eth" which is what you want. When you hit that button, you are now officially the owner! You do have to pay GAS fees yet again (get used to it because 2 more are coming up! ), but you are now official the owner of your own ENS name! For you to actually receive funds to this address you need to "set the resolver" and then "set the address it resolves to". 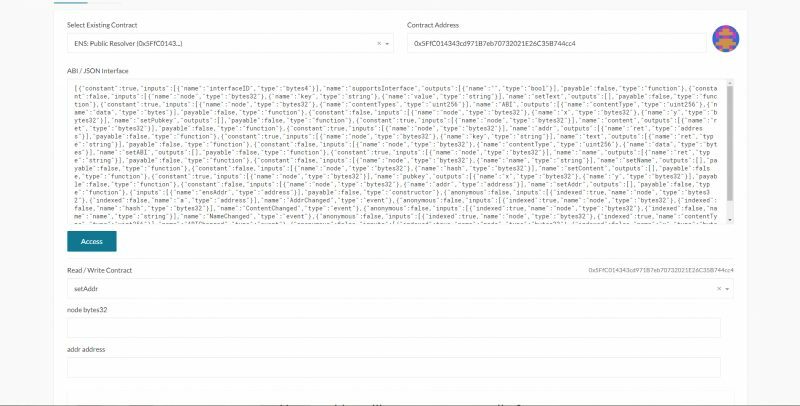 This basically means map your new name like cryptostache.eth to an actual Ethereum address you own. 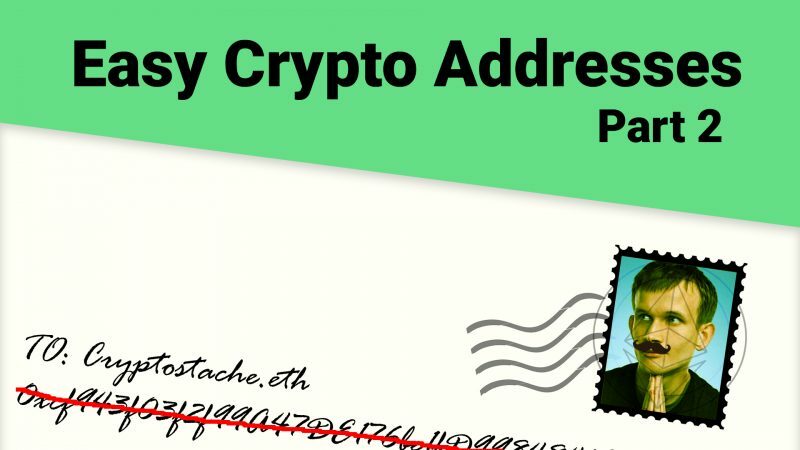 That way when people send you funds, it goes directly to that address. It would be nice if this was automatically done using the address that purchased it through the auction but it is not. 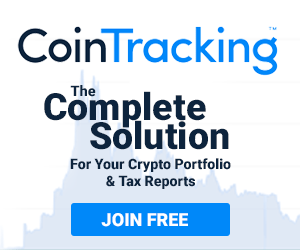 First, go to MyCrypto.com/contracts. This is where you will set the address to resolve to which is actually 2 parts. I followed the instructions here. First, to set what resolver we will use, in the "Select Existing Contract", you choose "ENS Registry 0x31415...". Don't touch the Contract Address box. Then you hit the"Access" button. A box for "Read/Write Contract" will popup and you have to select the function "setResolver" which gets you to step 2. Now that you have that info in place as the screenshot above shows. Hit the "WRITE" button and it will take you through sending this transaction, which you have to pay GAS on as well. You can see that I paid $0.11 in GAS to do this. 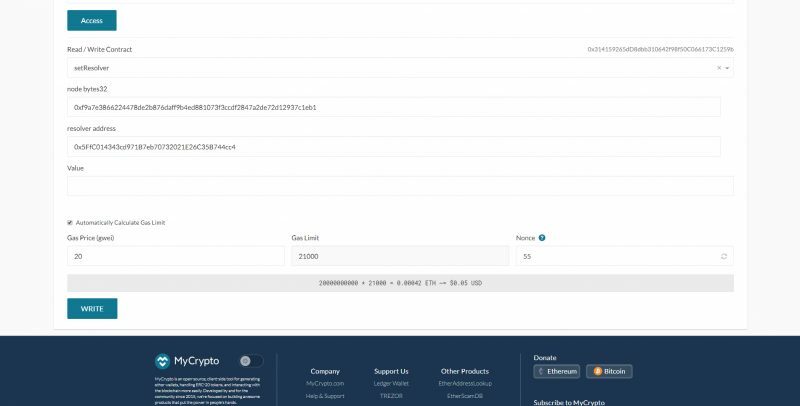 Now that transaction is processing you need to go BACK to the MyCrypto.com/contracts page to do the second part which is actually setting the address. Once back to the contracts page this time in the "Select Existing Contract" box pick ENS Public Resolver, hit the Access button, and choose "setAddr" for the Read/Write Contract box. 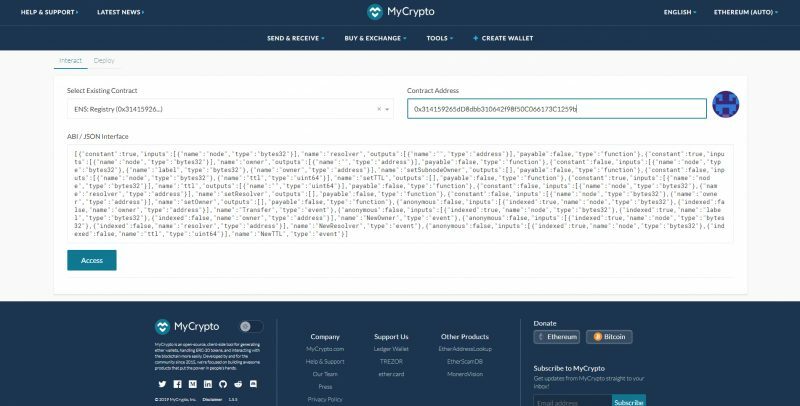 You will once again have to fill in the node bytes32 address with that same one from before which you can get by searching your custom name on Etherscan.io or Enjinx.io. Now the second box is different than last time and this is where you finally put in the Ethereum address you want your funds sent to when someone uses your custom name. I chose to use the same MetaMask address I used for the auction. Go ahead and hit WRITE and go through the process and confirm the transaction just like you did last time. GAS will be about the same. Success! You are now the proud owner of your very own ENS name and it is properly linked to a wallet of your choosing.